The 13th Prague Quadrennial of Performance Design and Space, a prestigious festival for theatrical and event scenographers in Europe, took place on June 18-28 2015. The Backstage Academy participated in the Prague Quadrennial to represent the UK on behalf of the Society of British Theatre Designers. The showcase exhibited projection mapping at a time when the technique is increasingly being used in theatres, operas and musical house for scene creation, which goes beyond simple backdrop projection. The UK based Backstage Academy is a training organisation for the live events industry. Backstage Academy plays an essential role in teaching the projectionists and creative designers of tomorrow, through degree courses, short courses and training programs for students, established professionals and community groups. 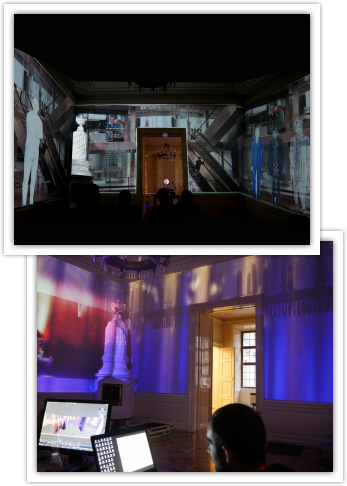 At the festival, Backstage Academy's BA Visual Production Students won a jury's award by creating an impressive edge-blended mapping installation on the walls of the Clam-Gallas Palac, an historic baroque palace in the Czech capital. Backstage Academy bridges the gap between industry and education, working closely with leading professionals and responding quickly to specific demands. Panasonic also encompasses these aims, in particular through finding solutions for specific demands and problems. This meant that Panasonic was an ideal choice to provide support for Backstage Academy at the Prague Quadrennial. For Backstage Academy the sponsorship from Panasonic meant connections and support from a high profile production partner. This was key to giving the students access to the latest tools used by the live events industry. The Backstage Academy students put together their Make/Believe showcase for the Prague Quadrennial using a Panasonic Lumix GH4 camers to shoot the designers’ assets in 4k. 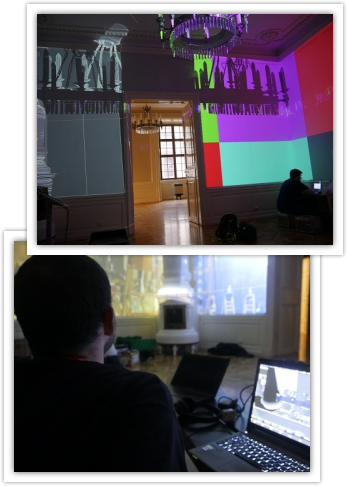 The students then used four Panasonic PT-DZ680 projectors to execute their projection mapping display. The students worked for six weeks building projection sequences, filming and capturing the model boxes and hand drawings from 30 theatre productions from 22 designers. "Having access to the remarkable model boxes and hand sketches from some of the world's best designers was a treasure trove of incredible inspiration. The Lumix GH4 gave us a powerful tool to digitise this and transform it into an immersive digital canvas,'' said Make/Believe curator Kate Burnett. The Make/Believe showcase utilised projection mapping technology to create an impressive feature. The mapping covered three interior, non-square, walls of the palace. The mapping was done around three doorways with a 6876 x 1200 pixel canvas. The projectors were driven using d3 media servers. These allowed the students to pre-visualise and simulate the projection coverage and to specify the correct Panasonic projectors for the complex interior space. Course Leader, Shannon Harvey remarked, "The PT-DZ680's met a number of our requirements in a difficult mapping space. We had power, weight and projector footprint constraints as well as a very short throw distance to work with. The Panasonic projectors gave us the brightness, resolution and contrast the exhibit demanded in an efficient and compact product, perfect for this type of installation." The Make/Believe project allowed seven Live Visual Production students to play an integral role in producing a ground breaking production, participating to the success of the world's largest scenograhic festival.